Many coily-haired women have noticed that after shampooing their hair they are left with dry, tangled, frizzy tresses and curls that have to be coaxed back to life. If you’re that curly debating between dirty or moisturized hair then there is a solution - cleansing conditioners. A cleansing conditioner is exactly what the name implies, a conditioner which has the ability to cleanse the scalp and hair. But what makes them a favorite of many coily haired naturals is the fact that they can effectively clean the hair without stripping it like traditional shampoos. But not all cleansing conditioners are created equally and some cleanse and moisturize more effectively than others. So to find out what conditioners are raved about read on for our top picks. Many ladies have flocked to the forums to rave about this conditioner and its ability to cleanse thoroughly. Because of a unique blend of tangerine, coconut and castor oil as well saw palmetto and phytosetrols the cream lifts the dirt from the scalp whilst leaving behind the natural oils your hair needs to remain moisturized and prevent frizz. This product is great for Type 4 curlies. Another inexpensive drugstore conditioner to try is the L`Oreal Paris EverCurl Hydracharge Cleansing Conditioner. This conditioner boasts an ingredient list that contains orange peel, grapeseed and coconut oil so curls are left hydrated long after cleansing. And you get all of this for under $10. This is a must try for any curly who wants to jump on the cleansing conditioner bandwagon. Type 2 and 3 curlies and women with fine hair will find that this leaves you feeling clean without the use of sulfates. 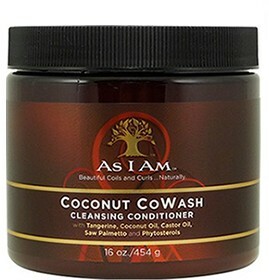 Like the coconut cowash the cleansing pudding from this line is also an effective yet gentle cleanser. Also ingredients like tangerine extract and serenoa serrulata fruit extract help to stimulate the scalp to promote growth and prevent thinning. This product is great for Type 4 curlies. As a cleanser this works wonders on the hair and is so gentle that it can be used daily. This product is perfect for curlies who workout often and sweat a lot in their scalps or curlies who style frequently and don’t want to shampoo too often but need to get rid of sweat and product build up. Daily fix seems to work best for curlies who are Type 3C-4A. With ingredients like rice bran oil, grapeseed oil and shea butter this cleansing conditioner will help to restore moisture to the hair after the cleansing process. As an added bonus the company left out any harsh and additional cleaning agents so that the conditioner can be left in the hair. Curlies who leave their conditioners in as leave ins will benefit from this product that can do double duty. This conditioner is very thick and concentrated thus it is great for Type 4 curlies as a little goes a long way. For curlies looking for a good cleansing conditioner that is inexpensive and easily available from most drug stores then this conditioner is it. It is sulfate and paraben free and contains moisturizing ingredients like camelina, apricot and grapeseed oil that will leave your hair clean yet soft. This product is light enough for Type 2 and Type 3a/b curlies to use without being left feeling greasy, and is great for any curly on a budget. It is easy to see why this product claimed Naturally Curly’s Editor’s Choice award as the reviews speak for themselves. As a cleanser this conditioner gets the job done but what makes it unique is that it also packs a mean slippery punch. With Behentrimonium Methosulfate as one of the ingredients it is easy to see why it is so slippery so you can cleanse and detangle in one step. This product is perfect for Type 3 curlies. If you’re looking for a cleanser that has many benefits then look no further than this creamy cleanser. Not only does it cleanse and moisturize but it strengthens the hair with ingredients like hydrolyzed corn, wheat and soy protein which can penetrate the hair shaft to repair damage from the inside out. After using this product you should notice hair that is frizz free, more defined and stronger. Based on reviews curlies who are Type 3C to 4A seem to love this product. This cream is perfect for cleansing regularly as the carrot seed oil, horse chestnut, sage leaf and Arnica montana flower extract ensures that this product hydrates as it cleanses. This product also contains silk amino acid which is a protein that has the ability to penetrate the hair shaft and repair and protect it. Also for the conscious curly you can rest easy knowing that this product is organic, paraben, silicone, sulfate, and cruelty free. Curlies who are in the Type 4 range should give this conditioner a try.